“Roads to Safety” will launch on May 24th to coincide with Part 1 of the webinar, and all participants will receive the link to download the PDF. It will also be available via Clicklaw. Elder abuse and violence against women aren’t separate issues, and we believe that they must not be separate conversations. That’s why West Coast LEAF (Women’s Legal Education and Action Fund) and the Canadian Centre for Elder Law are offering a free webinar for front-line service providers to explore the legal challenges that are most likely to impact older women in BC who have experienced violence. Each session will be framed by discussion of the insights that 450 older women shared with us in nine different languages as part of the Older Women’s Dialogue Project. Throughout the webinar, we’ll maintain a focus on the gendered dynamics of violence against older adults. We aim to prompt reflection about how legal challenges in the aftermath of abuse can vary based not only on age and gender, but also based on ability, citizenship status, Indigenous identity, language, access to financial resources, and more. 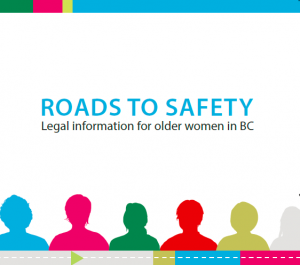 We hope you will come away with greater confidence in talking to older women in BC about their legal rights and options in the context of abuse. This webinar is part of the Older Women’s Legal Education Project, a collaboration between West Coast LEAF and the Canadian Centre for Elder Law. Funding has been generously provided by the BC Council to Reduce Elder Abuse. Questions? We would love to hear from you! Please contact Alana Prochuk at education@westcoastleaf.org or 604-684-8772 extension 117.